There are some niche brands out there that just get it – they know how to offer interesting, well-crafted perfumes that are both easily wearable and suitably intellectually stimulating. Maison Francis Kurkdjian is one of such brand, and having thoroughly explored each and every corner of this ‘maison’ I can honestly say that I’m yet to come across a single dud. This, of course, is no surprise seeing as the patriarch of the Maison is none other than venerable perfume Francis Kurkdjian. At a recent Perfume Lovers London event Kurkdjian said that it’s the stories behind the scents that make them what they are, musing that Shalimar wouldn’t be Shalimar without its name and that scents cannot me detached from the names they are bestowed. Perhaps this is why his brand is so enjoyable – each scent tells a story. His latest perfume – Aqua Vitae – tells the story of “the space between us” and takes its name from the water of vitality. Created to evoke “a magic breath” and “the shiver of pleasure on the back of the neck before something wonderful occurs” Aqua Vitae is a fragrance that casts a beautiful golden light, exuding serenity and peace. In the top notes Aqua Vitae displays a wonderful balance between citrus and woods. The lemon, and possibly bergamot, is incredibly crisp and bright, whereas the woods are plush and spicy, emphasising the vivacity of the citrus notes. A big wave of luminous, green jasmine in the form of Hedione quickly follows and it gives Vitae a massive lift, creating an enveloping presence. A soft, aqueous vanilla floats just under the surface, giving off delectable hints of banana-like ylang ylang and chantilly cream. The vanilla is used in a relatively subtle manner but there is just enough to ensure that the transition between the vivacious top notes and the warm woods of the base is perfectly smooth. In comparison to Kurkdjian’s other aquatic offering – Aqua Universalis – Vitae seems immediately warmer and sunnier. To me it is the golden light of the sun reflected off of a lake rather than the icy water running through the cold stones of a stream that is Aqua Universalis. Both are worthy additions ti any collection. Aqua Vitae is THE perfect scent for summer. It has a relaxed, effortless sort-of vibe meaning that is is rather well suited to long, demanding days spent under the sun. I’ve found myself relying on it quite heavily over the last few weeks – liberally spraying it on throughout the day and basking in its joyful, golden glow. Aqua Viate is available in 70ml (£115) and 200ml (£175) Eau de Toilette. Sample via Maison Francis Kurkdjian. Notes and quotes via press release. Image via cafleurbon.com. Image 2 my own. Posted in Citrus, Floral, Maison Francis Kurkdjian, Perfume Reviews, Woody and tagged Aqua Vitae, Citrus, Floral, Francis Kurkdjian, Maison Francis Kurkdjian, Woody. Bookmark the permalink. With a promised two week heatwave I think you’re going to be relying on it a lot more! I think it’s my favourite perfume from Maison Francis Kurkdjian. I’m going to review this one next week. I’m glad you have found a favourite! Whlst The Dandy isn’t, stictly speaking, such a sticler for wearability – after all I seem to be labouring under the illusion that m/mink is quite an inconspicuous spritz – when we do get some heat then straightforward but intelligent apparent simplicity is a definite yes and this is what this scent and this scent seem to perfectly embody. Lovely summing up of a perfect summer spray. 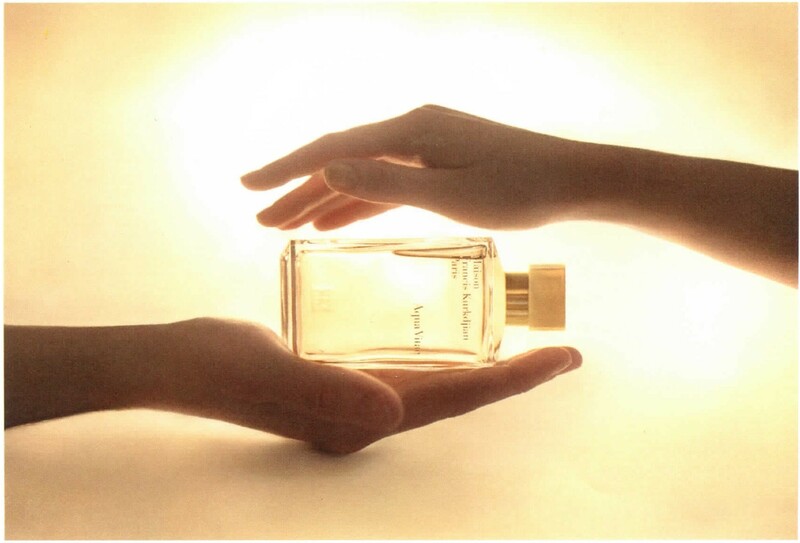 I know what you mean – one should wear what one wants to, whenever one wants to and lots of heavier fragrances sing in the heat (Angel, for example, is perfect for hot, sticky summer nights). Some fragrances just fit the season and Aqua Vitae is one. So glad you enjoyed the review! well it is uncharacteristically hot over here in foggy San Francisco. I could sure use a bottle of Aqua Vitae just about now! Your review of it makes my mouth water… it was indeed a pleasure to read. My bestie has just come back from San Francisco – I’m so jealous! She didn’t mention the fog though. Glad you enjoyed the review, Vitae is a beaut’. Thank you for the helpful review, CPB. I can just about smell it through your clear description. Can you say, is suggested as a men’s fragrance, specifically, or is it unisex? As I remember, with APOM, there was one for men and another for women. Is Aqua Vitae like that? Thank you! I’m planning to try Aqua Vitae soon. Mr. Kurkdjian looks quite handsome and friendly!